Who doesn't like onion rings? Well, I'm sure that there are plenty of folks that don't, but I'd of course be suspicious of them. These monsters are coated in an amber ale batter that provides a thick but nicely crisp exterior. In fact, they would probably be more aptly named "crunchy onion doughnuts". 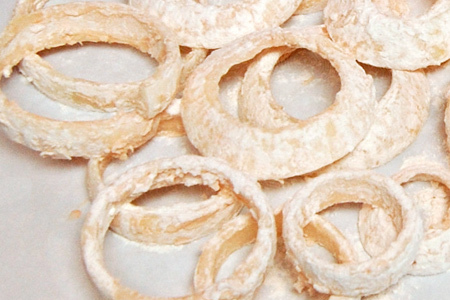 Sure, making onion rings at home is a bit messy and sort of a pain. I'll admit that these were born of necessity. Yesterday I was grumbling under my breath as I scoured the freezer section of the grocery store. I typically opt for the easy way out in the form of Ore-Ida® Gourmet Onion Rings, but they had none. I decided to look at the silver lining. I'd get to do a little recipe development and I'd get a blog post out of the deal. Add the buttermilk and hot sauce in a large flat-bottom container, and whisk well to combine. 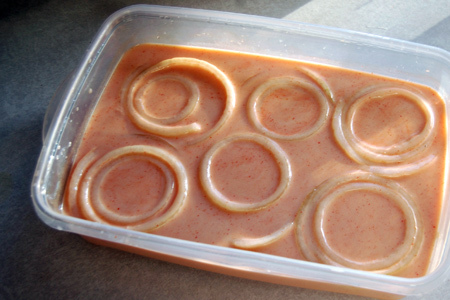 Add the onion rings to the buttermilk mixture, arranging them so that they are submerged. Cover and refrigerate at least two hours, or overnight. About 45 minutes before your ready to serve, heat the oil in a deep-fryer or a large heavy pot to 365º. I used an enameled cast iron Dutch oven. 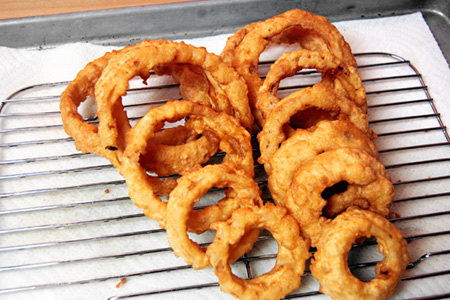 While the oil is heating, batter the onion rings. Add the flour to a large bowl. One at a time, remove each onion ring from the buttermilk mixture, put it in the flour and coat all sides, knocking the excess flour off on the side of the bowl. Set each ring on a large sheet of wax or parchment paper. Add the baking powder, beer, eggs and seasoned salt to the flour and whisk well to combine into a smooth batter. You want a batter that's barely more loose (thinner) than pancake batter. Add more beer if it's too tight (thick). Line a large lipped sheet pan with wax or parchment paper, and insert a wire rack. Line another lipped sheet pan with paper towels. Preheat your oven to 250º and put the paper towel-lined pan on the center rack. Dip each ring in the batter until it's completely covered. 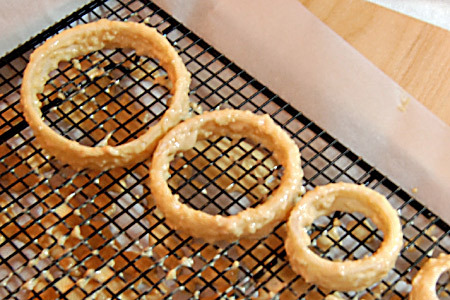 Set the rings on the wire rack to allow the excess batter to drain. 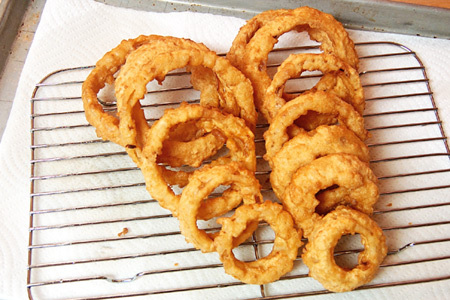 Working in batches, fry the rings until they are nicely golden brown, 2-3 minutes per side. Be careful not to overcrowd the fryer/pot. Tip: I like to use a bamboo skewer to handle the rings while frying. It makes maneuvering them very easy, the wood stays cool, and they're disposable. Season the rings lightly with salt and pepper immediately after they come out of the oil. Set them in the paper towel-lined pan in the oven so that they stay hot. I am so envious! I wish I could make my onion rings so thick! I am going to try your recipe. I will have to try these rings. Look so delicious!!! Thanks for the bamboo skewers tip. Wonderful post! Have a happy new year! Those look perfect, light and crispy. I would hate to have a burger with this, because then I'd have less room to fill up on onion rings. But if I only had one or two rings, how great would these be on your favorite burger? Chris - First, thanks for your kind comments. Ironically, I was thinking of these as burger toppers just this afternoon. They are most definitely monster-burger-friendly. I'll take a batch, thank you!!! So pretty too. This recipe looks great. I've got a batch of home-brewed Amber that I'm looking forward to trying this with! Love your recipes, a few of them have made their way into my keeper file. YUM! Just got done making these. Used the leftover batter to dip potatoes and green beans in. Thanks for a great recipe!